Frameless glass pool fencing is an elegant solution that provides uninterrupted views of your pool area while increasing safety. Semi frameless glass pool fencing provides the perfect solution adding stylish look while meeting legislated safety regulations. We offer all types of external glass balustrading. Whether it be for your balcony or stairs. Create stunning contemporary interiors that will look great in both domestic and commercial situations. 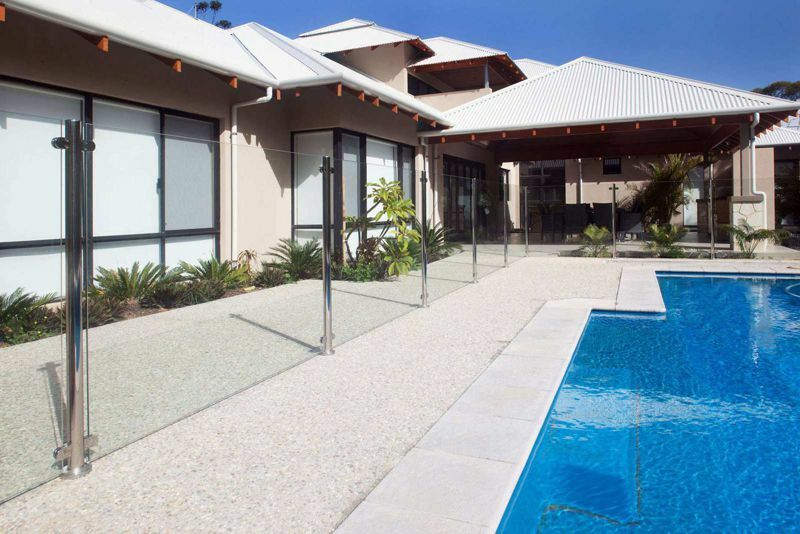 Clear-Az-Glass Fencing is a leading supplier of Glass Pool Fencing & Balustrading in Perth, Western Australia. In addition to frameless and semi-frameless glass pool fencing, we also supply and install glass balustrading, gates, tubular fencing and aluminium wood look screens. At Clear-Az-Glass Fencing, we understand that pool safety should not compromise aesthetics. We design and install glass fencing in Perth that not only adheres to safety regulations, but provides you an unobstructed view of your pool. Every glass fence can be made to order; their elegant designs are sure to enhance the value of your property. At Clear-Az-Glass, we opt to utilize 12mm toughened grade A safety glass, stamped with the AS/NZS stamp of compliance so that our customers know that they are receiving the best product the industry has to offer. Our customer service consistently exceeds customer expectation and is a leader in the industry, don’t settle for a glass pool fencing company in Perth, WA that will only provide you a good price. Clear-Az-Glass is dedicated to our customers, delivering information, service and workmanship in a clear and concise manner, our glass isn’t the only thing that is clear-az! The best thing about our services is that we’ll go out of our way to provide you a cost-effective solution for all your fencing needs. Regardless of the design you have in mind, you can be sure that we’ll deliver the best glass pool fencing Perth has to offer, that exceeds your expectations at a cost-effective price. We service both residential properties and commercial establishments all over Perth, including the Metropolitan Region and its surrounding suburbs. We are able to send a Clear-Az-Glass representative to your house or business for a free measure and quote! Get in contact us today and let’s discuss how we can help you. We serve our wonderful customers right across Perth, Western Australia including the following suburbs; Joondalup, Padbury, Carine, Duncraig, Kallaroo, Mullaloo, Sorento, Ocean Reef, Karrinyup, Marmion, Hillarys, Scarborough, Trigg, North Beach, Cottesloe, Claremont, Nedlands, City Beach, Wembley, Floreat, Mt. Lawley and South Perth. Talk to us today to see if we visit your area.